The concept of Walking Europe followed on from "Walking Britain" and "Walking Switzerland". Most of the page design was transferred from these sites. The basic work in constructing the site began in July 2003 with subsequent development continuing in the following months. The first pages were available to site visitors in late September 2003. Development of Walking Europe will be a greater challenge than Walking Britain purely because of the greater potential for development. Europe as a continent is huge and the areas that offer quality walking are many and varied covering every country. 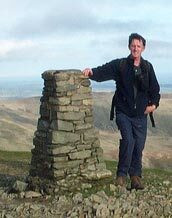 The site will probably always be a 'one man effort' although a few people are sending in their own ideas for walks. It is hoped that these will increase in volume so that walkers throughout Europe can share their favourite walks with other people. The content on this site is provided free of charge with advertisers just covering the rising costs of hosting and bandwidth charges. Walking Europe will never be a profit making enterprise but will form my contribution to the resources that will help you enjoy the mountains of Europe. With the future in mind (and a growing back log of walks ready for publication) the decision was made in early 2007 to begin the process of updating the site. The overall intention is to make addition of new material far easier and therefore the database driven format introduced mid-2006 at Walking Britain will be cloned in a simplified manner.